- Instant mashed potatoes (made from 1 full packet — follow directions on the box) ** You can obviously use leftover mashed potatoes as well. I believe 1 packet of instant flakes makes about 3-4 cups potatoes, so if you’re using leftover stuff, adjust your other ingredient measurements accordingly. In a large bowl, mix all ingredients until everything is uniformly incorporated. Spray a large pan/skillet with Pam and set it on the stove over medium/high heat. 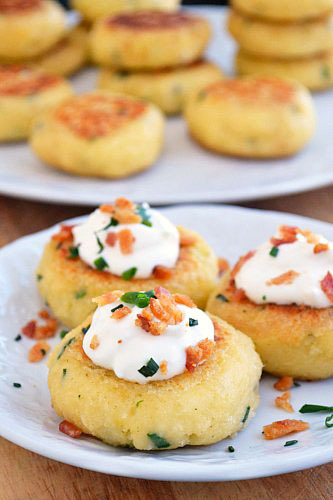 Serve warm, with sour cream and bacon bits.